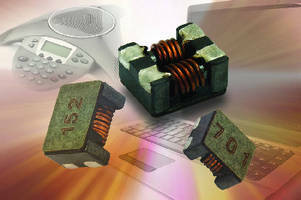 Surface-Mount, Common-Mode Chokes feature 8 A rating. With max rated voltage of 80 Vdc, Models ICM-2824, ICM-3528, and ICM-4743 feature low DC resistance from 0.006-0.015 W at rated currents from 8.0 A down to 4.0 A, and common-mode impedance ranging from 300-1,500 W at 100 MHz. All models operate from -25 to +85Â°C with insulation resistance of 10 MW. Devices provide noise suppression for power line applications in LANs, PCs, CD-ROM drives, telephones, and electronic games. MALVERN, Pa. - Vishay Intertechnology, Inc. (NYSE: VSH) today announced the release of three new surface-mount, common-mode chokes offering low DC resistance, high current-handling capability, and high stability for DC power lines. The new ICM-2824, ICM-3528, and ICM-4743 common-mode chokes from Vishay Dale are designed to provide noise suppression for power line applications in local area networks (LAN), personal computers, CD-ROM drives, telephones, and electronic games. The devices released today feature low maximum DC resistance from just 0.006 W up to 0.015 W at rated currents from 8.0 A down to 4.0 A, and common-mode impedance ranging from 300 W to 1500 W at 100 MHz. All three chokes provide a maximum rated voltage of 80 VDC, insulation resistance of 10 MW, and an operating temperature range of - 25 °C to + 85 °C. Offered in lead- (Pb) free, surface-mount packages with treated base terminals, the devices allow for easy mounting to the PCB and feature a paired wire coil for high stability. The ICM-2824, ICM-3528, and ICM-4743 measure 7 mm by 6 mm, 9 mm by 7 mm, and 12 mm by 11 mm, respectively, with maximum heights of 4 mm, 5 mm, and 6.3 mm. Part number   Impedance @ 100 MHz   Rated current max. DC resistance max. Samples and production quantities of the new common-mode chokes are available now. Lead time for production quantities is 10 weeks. Pricing for U.S. delivery only ranges from $0.48 to $0.68 in 10,000-piece quantities. Follow Vishay common-mode chokes at twitter.com/vishayindust.